The decision issued late Friday by U.S. District Judge Sharon Gleason leaves intact President Barack Obama's policies putting the Arctic's Chukchi Sea, part of the Arctic's Beaufort Sea and a large swath of the Atlantic Ocean off the U.S. East Coast off-limits to oil leasing. Trump's attempt to undo Obama's protections was unlawful and a violation of the federal Outer Continental Shelf Lands Act, Gleason ruled. Presidents have the power under that law to withdraw areas from the national oil and gas leasing program, as Obama did, but only Congress has the power to add areas to the leasing program, she said. Trump's move to put offshore Arctic and Atlantic areas back into play for oil development came in a 2017 executive order that was part of his energy dominance agenda. The order was among a series of actions that jettisoned Obama administration environmental and climate-change initiatives. FILE - The lagoon complex is seen in the Izembek National Wildlife Refuge, located in Alaska's Aleutian Islands, in this U.S. Fish and Wildlife Service picture taken Aug. 24, 2010. Gleason, in a separate case, delivered another decision Friday that blocked the Trump administration's effort to overturn an Obama-era environmental decision. 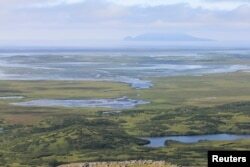 Gleason struck down a land trade intended to clear the way for a road to be built though sensitive wetlands in Alaska's Izembek National Wildlife Refuge. The Obama administration, after a four-year environmental impact statement process, determined that the land trade and road would cause too much harm to the refuge to be justified. Trump's then-interior secretary, Ryan Zinke, broke the law when he summarily reversed the Obama policy without addressing the facts found in the previous administration's study of the issue, Gleason ruled.